This brings to mind another similar controversy; -annulene. Here too, correlation and dispersion are important. 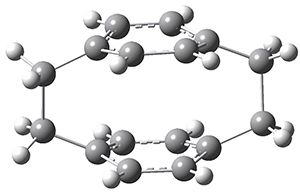 The controversy is between crystallography (which appears to show a D3d-symmetric structure with no bond alternation) and NMR (which strongly suggests a bond-alternating structure of C2 symmetry). I gather that since there is very little -annulene in existence, no further experiments to resolve this divergence have emerged recently. See doi: c5fdv9. I have taken a look at another famous, perhaps even at one stage controversial property of benzene rings, the value of the so-called Kekulé vibrational mode. The point of interest was how stacking two benzene rings on top of each other might affect the mode, and whether the bending of these rings and their spin state affects things.